The Rotterdam Sightrunning Tours and the World Port Days! During next year’s World Port Days (September 6th- 8th, 2019), The Rotterdam Sightrunning Tours will offer you different types of running tours again! Next year’s theme is not known yet, but as soon as we know we’ll make sure we bring some runners-energy to this fantastic event. Please keep an eye on our website and facebook page! 'World Port Morning Navy Run'. On Saturday and Sunday morning you have the chance to join a great maritime running tour, in cooperation with the Dutch Navy! Who is joining running tourguide Anne on Saturday or Sunday morning, September 8th/ 9th, together with ‘real navy men (and women)’, for a great run! On the picture she is still on her own, but she knows you will come and help her out to stand up tall against all these Navy muscles! 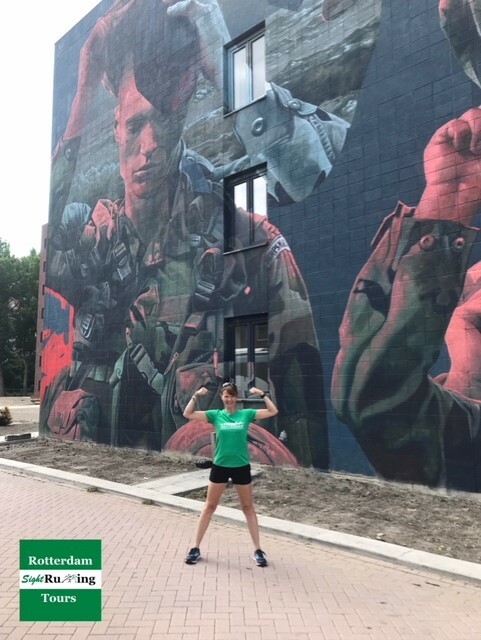 We’ll start our run at 8.20am in front of the Marathon statue on the north side of the Erasmusbridge, together with our awesome Dutch navy men (and women)! And we'll explore the festival area in a fun way while running. Around 10am we’ll be back at the Marathon statue. Would you like to experience the festival from a different point of view and at the same time have an awesome running- workout together with the Dutch Navy? *This run takes place before the festival area opens up for the public. *The run is max. 7km en we'll be running at a 'conversational- pace'. There will also be moments where we will stop for a little chat or a picture. This makes our tour accessible for any type of runner. *The tour costs €19 p.p. The Heijplaat- RDM area is a hidden gem, situated in Rotterdam. Amongst others the Steamship ‘SS Rotterdam’ was built there and a whole town was founded because of the employment of the RDM. Nowadays the area has a different function and we would like to show you the past, present and future all mixed up during our Saturday and Sunday afternoon running tour. We meet at the waterbus- stop on Katendrecht ( next to the SS Rotterdam) at 1.30pm. From there we will take the waterbus to Heijplaat-RDM. In approximately 15 minutes we will change our scenery from city to port- life, where we are going to explore the area while..? Running! After about an hour we will take the water us back to Katendrecht ( our starting point). Are you interested in running and exploring a different part of Rotterdam? Would you like to see the Port in action while running and get all energized because of this vibrant, yet quite unknown area? *The tour will cost €24 p.p. *The waterbus ticket is included in our price. *Make sure you are not late! *Anyone arriving áfter 1.40pm is too late and is going to miss this awesome tour as we don't want to miss the 'bus'! There is a maximum amount of tickets available!